Last updated by Mark Jala at December 22 . This Circulon Infinite Cookware Set review is unique. It awards my choice for Best Value of both anodized aluminum cookware sets and best value for nonstick cookware sets. Circulon Infinite cookware is durable, dishwasher safe, and has unique ridges on the cooking surface making Circulon an industry leader, and the Circulon Infinite cookware line, a winner in multiple categories. Innovative design elements like easy-pour edges, locking straining lids, nonstick surfaces both inside and outside, and the Circulon patented hi-lo cooking system are easy to like. No more warping, mismatched sets, or scratched cookware. Say hello to a set that is flat, durable, nonstick, and dishwasher safe. People enjoy cooking even more when they have new cookware! Perhaps your cookware is chipped or peeling. Maybe they are slightly warped and don’t lay flat. Maybe yours sticks too much, doesn’t perform the way you would like it to, and perhaps you want a cookware set that is dishwasher safe. You may have noticed scratches on the cooking surfaces of your cookware and concerned about the health safety. Do the handles get too hot? Is too heavy? Perhaps you would like cookware that is nonstick and easy to clean. If you are like me, I have some cookware that has been passed down from my parents and other family members. I have a little bit of everything. I know I get tired of some pieces that are warped and don’t lay flat on my GE flat ceramic stove top. It would be nice to have cookware with comfortable handles that stay cool, heats evenly and all the way up the sides of the cookware, and maybe even uses less heat. And it would be great if that cookware could last for many years to come! In reviewing hard anodized aluminum cookware sets, I found one that stands above the rest when it comes to VALUE. There are many brands to consider including All Clad, Calphalon, Circulon, Cuisinart, Farberware, and KitchenAid. But when it came to the ultimate value of the set, only 1 kitchen set remained. Hard anodized aluminum is a popular material for cookware because it is lighter and stronger than stainless steel. That makes it easy to use and durable! Being aluminum, it provides excellent, even heating. When you start cooking with this Circulon Infinite hard anodized aluminum set, you will find it heats very quickly! You will find that being aluminum all the way up the sides, it heats all the way up the sides of the cookware, surrounding your food with a perfectly even heat. Unique to Circulon Infinite, the stainless steel base assures level cooking that is great for all stoves, including induction. There are plenty of nonstick cookware sets available to choose from. They come in all price ranges. However, when you start to handle the various cookware brands some just don’t compare. Some don’t perform well and start to peel or flake rather quickly. Some lose their nonstick surface qualities. One product stood out for best value. 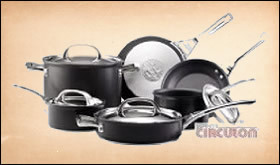 Circulon is well known for their durable, long lasting nonstick surface. In fact, their nonstick surface, called TOTAL, is guaranteed to outlast all other nonstick surfaces! Unique to Circulon, their TOTAL nonstick surface has raised circles that minimizes the surface area touching your food. It helps keep fats and oils below your food, and makes cleanup a snap. 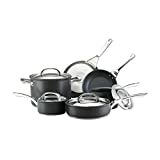 The TOTAL nonstick surface, like more expensive anodized aluminum cookware, includes the nonstick surface not only on the inside of the cookware, but also on the outside. This avoids the traditional dingy appearance some anodized aluminum cookware can get over time, and makes cleanup super easy. You don’t have to worry about a mess after you cook up a storm. Just throw the Circulon Infinite nonstick cookware in the dishwasher! The cast stainless steel handles stay cool. The stainless steel lids fit securely. And the Circulon Infinite stainless steel base stays flat on whatever type of stove you have. The flat bottom base is great on flat top stoves! Thinking about induction? No worry. The Circulon Infinite 10 piece cookware set is induction ready! It is well built. When you hold Circulon Infinite cookware, you know you are handling solid cookware that will last. It has a very flat bottom that does not warp. It bugs the Dickens out of me when cookware warps and makes it hard to cook. Circulon Infinite has a very flat and sturdy bottom that does not warp. The handles do stay cool. It is dishwasher safe. I put mine in the dishwasher almost every time and the nonstick surface is still very good. 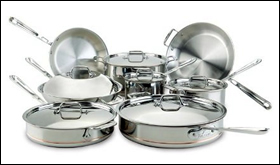 The stainless steel lids are easy to clean and attractive. They fit well. The 8qt stock pot and 3qt saute pan are excellent sizes. The aluminum construction heats up the side walls and surrounds food with a nice even heat. The hi-lo ridges. I have to admit I wasn’t fond of them in the beginning thinking it was all hype. After a little usage I realized they do help make the nonstick surface better than most. The price. You get a lot of long lasting cookware for a great price and this makes it an excellent value. As a serious cook I want a 12″ skillet. Is it too much to ask for? The extra size makes it easier to cook larger quantities of food. You can’t use high heat. Using high heat with Circulon Infinite cookware will reduce the performance of the nonstick surface. Minimize even the use of medium high heat. Pre-heated, even medium heat can however do a great job on most cooking jobs. As with most nonstick and hard anodized cookware sets, they don’t come with a stainless steel skillet. As a serious cook, you’ll want a stainless steel or high heat nonstick skillet for searing and browning. Check out the Cuisinart MultiClad Pro 12″ stainless steel skillet. Please note: While the dashboard says it is clad only on the bottom, that is true, but the anodized aluminum material is at the entire core of the cookware including the side walls. All-Clad stainless steel cookware is an original that can last a lifetime. Fully clad up the side walls with aluminum helps surround food with even heat. Being replaced by the All-Clad d5 Brushed Stainless Steel cookware doesn’t mean this stainless steel is any lesser quality. All-Clad stainless steel cookware has been around for a long time and deserves all the accolades and attention it gets. The nonstick coating on any of this cookware is PFOA free. All-Clad Stainless Steel cookware is slowly being phased out in favor of the All-Clad d5 Brushed Stainless Steel Cookware. This is still still awesome cookware that can last a lifetime. All-Clad MC2 cookware is the 2nd generation of Master Chef cookware. Brushed aluminum exterior, fully clad with aluminum and stainless steel inside provides a chef’s dream cookware. Even heat distribution is provided by the 2 layers of aluminum. Any items with the All-Clad nonstick interior is now PFOA free for better health. This is cookware designed for folks who love to cook. All-Clad MC2 cookware is solid and durable, able to last a lifetime. All-Clad makes another winner with the MC2 cookware. The 2 layers of aluminum provide exceptional heat distribution any home cook will enjoy. This is solid cookware tough enough for any home. 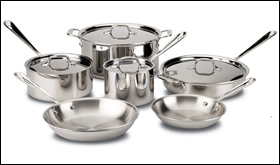 All-Clad d5 brushed stainless steel cookware is a new generation of stainless steel. 5-ply with a patented stainless steel inner core provides for less warping and better induction performance. This new All-Clad d5 brushed stainless steel cookware has design features not seen on the original stainless steel. They help make the cookware easier to use and perform better for a wider selection of cooking methods. This is the best stainless steel and aluminum cookware All-Clad makes. Solid and durable, this is American made cookware to last a lifetime. All-Clad has another winner on it’s hands with the All-Clad d5. This is a new product line set to replace the original stainless steel line. It has several design elements not in the original that makes All-Clad d5 cookware easier to use and handle. I highly recommend it. All-Clad Copper Core cookware is the best cookware available, bar none. All-Clad uses the best materials to make a 5-ply cookware every experienced cook will want. The inner core of copper, exposed in the ring along the bottom of all pieces, is quick to heat and quick to regulate. The copper is surrounded by aluminum and then top quality stainless steel. It is healthy cookware. While it is dishwasher safe, the detergents will discolor the exposed copper ring. When one pays this much for top-quality cookware, I would recommend hand washing. Like all All-Clad cookware, Copper Core is quality cookware that will last a lifetime. This is bar none the best cookware available, and it should be at that price. Copper simply does an excellent job heating quickly and regulating temperatures quickly. All-Clad uses the best materials in the proper proportions and makes this top-of-the-line cookware every experienced cook will thoroughly enjoy. This is really not for novices. The more one cooks the more one will enjoy All-Clad Copper Core cookware. Scanpan CTX cookware is is much like their fully clad 5-ply CSX cookware except with their healthy nonstick surface inside all of the cookware. Scanpan CTX cookware offers cooks the full range of cooking methods including high heat methods. Scanpan CTX is fully induction ready. With a modern look, vented glass lids and rounded corners, Scanpan CTX is easy to use for both cooking and clean-up in the dishwasher. Scanpan CTX offers novice and experienced cooks the best of both worlds – an attractive and easy to clean stainless steel exterior and a high heat capable internal healthy nonstick surface. Scanpan has a real winner on their hands here with CTX cookware. 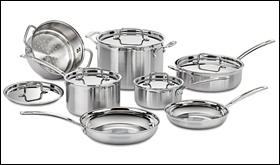 Scanpan Professional Cookware adds stainless steel handles and lids to the Classic cookware line. Scanpan Professional is created using the company’s patented technique which involves superheating a ceramic-titanium compound so that it fuses with the pressure-cast aluminum base. This creates a long-lasting nonstick surface with excellent heat distribution properties. Since it is more than a nonstick coating, it is more durable, even tough enough for metal utensils. The handles and lids are created from stainless steel and are riveted to the main body for strength and durability. The nonstick surface is created from Scanpan’s Green Tek compound, which is environmentally friendly and is non-harmful to the human body. In addition, no environmentally harmful chemicals are used in its production. All of the products in the Scanpan Professional Cookware line are oven safe to 500˚F, metal utensil safe, dishwasher safe (although hand washing is recommended) and come with a lifetime warranty. Perfect food release, easy to clean. Dishwasher safe. Scanpan Professional is nearly identical to the Scanpan Classic cookware, but with stainless steel handles and lids. I love Scanpan products, so if you are looking for a touch of stainless steel, then Scanpan Professional cookware is a good choice. SCANPAN's squeeze-cast aluminum products are made with patented ceramic titanium surface technology but are NOT made of ceramic. Scanpan Classic Cookware features a patented ceramic titanium nonstick surface that is more than just a coating. It is durable and meant to last. It is heated to 30,000˚C during the manufacturing process, allowing it to fuse with the compressed aluminum core. This Scanpan ceramic titanium surface is a really good nonstick. The handles are made from a high-density phenolic resin and are attached securely to the pan without rivets, while the lids are created from break-resistant glass, encased in a metal rim for extra durability and style. All of the products in this cookware line are oven safe to 500 degrees, dishwasher safe, metal utensil safe and come with a lifetime warranty. The Scanpan Classic cookware nonstick surface is a healthy cooking surface in that it is PFOA and PFOS free. In fact, Scanpan was the first worldwide to make such a product. I am a big fan of Scanpan Classic cookware. I put mine through severe long term tests and it still does fantastic. Scanpan Classic cookware is a good way to introduce yourself to Scanpan, unless you want to jump right in with the brushed stainless steel varieties of Scanpan CSX or Scanpan CTX. Squeeze-cast aluminum body provides optimal heat distribution to ensure cooking performance is consistent. Built to last in Denmark with a limited lifetime warranty for your piece of mind. PFOA-Free and dishwasher safe.